A low pressure trough and frontal system are over western Canada this morning (see satellite picture below). 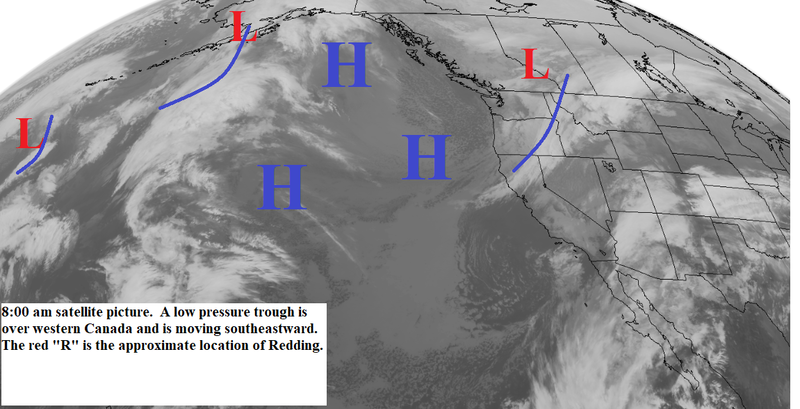 This system is dropping southeastward with the southern end brushing Northern California. Today will be cloudy to partly cloudy with a few light showers over the mountains north and east of the valley. Thursday through Saturday the high pressure ridge moves a little closer to the coast. The north state will be mostly clear with above normal daytime temperatures. Gusty north winds will occur Thursday and early Friday. Sunday and early Monday another trough will drop through western Canada into the Central U.S. (see map below). Once again we will see some clouds with a few mountain showers north and east of the valley. Clear skies and warmer temperatures Tuesday and Wednesday. The longer range models continue to hit at a wetter pattern toward the end of the month.